Halogen bulbs are made up of a combination of halogen gas and tungsten filament, which produces a chemical reaction. Halogen bulbs operate at a higher temperature than standard incandescent light bulbs and offer higher luminous efficiency. Because halogen bulbs are different from regular incandescent bulbs, there are a few things to remember and watch for when testing or troubleshooting a bulb. 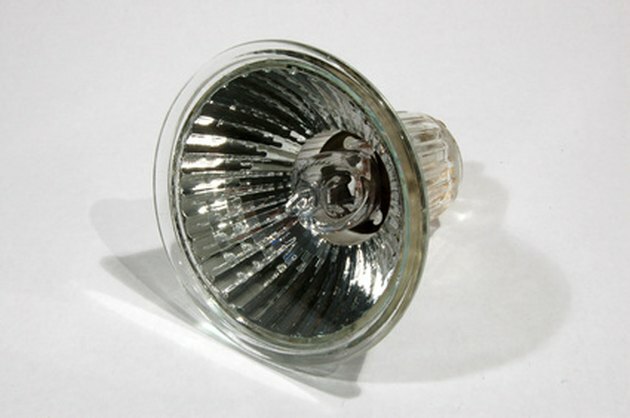 Halogen bulbs differ from regular bulbs in temperature and brightness. Wait until a bulb has been on for a couple minutes to see its full potential and luminosity. Halogen bulbs take longer than regular light bulbs to reach the temperature needed for the chemicals inside of them to work. For this reason, it is not suitable to use a halogen bulb for lighting a closet, refrigerator or any other light that is only on momentarily. Refrain from touching the bulb with bare skin. Contaminants and residue from fingerprints can create a hot spot on the surface of the bulb. The localized heat will cause the quartz to change into a crystalline form that leaks gas. The strains from the gas can cause the light to crack and explode. If you do accidentally touch a bulb, clean the surface with a rag or tissue soaked with alcohol and rinse with water. Look for any bubbling effects on the bulb. Bubbles are indicative of contaminants that have already damaged the bulb. If the light continues to operate, the bubbles will form cracks and the light may explode. It is best to replace the bulb as soon as possible. Inspect the color of the bulb when the light is off. If the bulb is old or of low quality, it will exhibit a smoky black or dark gray color instead of the correct white or light gray color. A dark smoky color will usually indicates an old bulb in need of replacing. A lighter smoky appearance usually indicates that there is cracking in the bulb.